For those who find them useful (and who doesn’t? 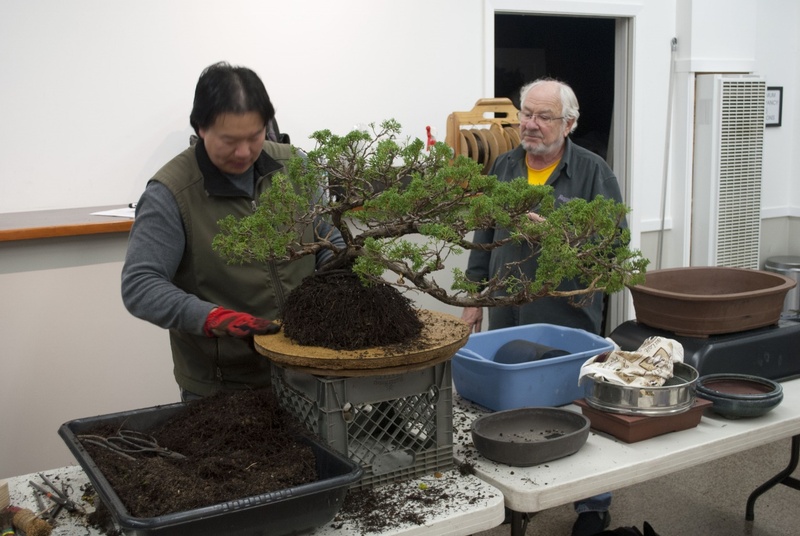 ), Peter Tea’s handouts made a return in January, to help summarize and enhance the information he gave us in his engaging repotting demonstration. In any case, I am not going to try to summarize Peter’s entire demonstration because most of the important information is in that handout, and I still think you should really go there yourself if you want everything out of the presentations. Though when future meeting notes are officially separate, I suppose I’ll have the room to go into a little more detail (sarcastic “yay!”). True to his promise, Peter did repot two member trees, though the second ran rather late. 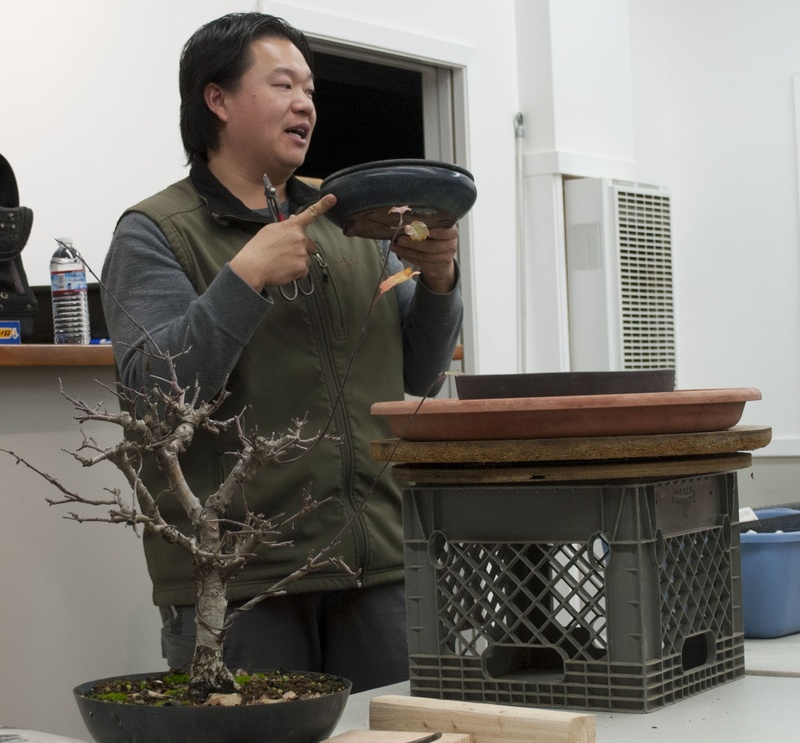 Before he started on either, he talked for about an hour about the reasons for repotting as well as the specific techniques, and how the type and health of the tree can factor into the seasonal timing of everything. That was the handout stuff. 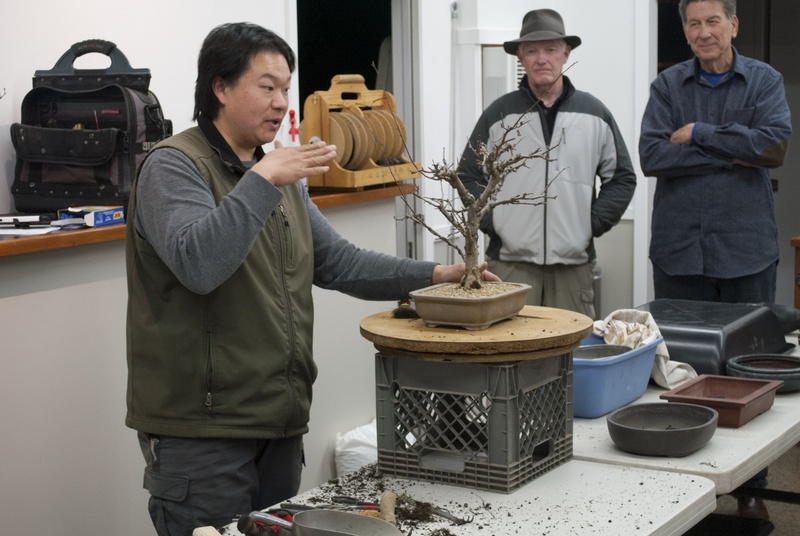 And then, of course, there were the tidbits that were added throughout the lecture and the repotting demo that followed. Some of my favorite tidbits, or ah-ha! moments, during Peter’s presentation: When discussing mounding the soil around a tree versus leveling off the soil, Peter gave many pros and cons to consider, including the age conveyed through mounding and the ease of working with roots when leveling. One point I found especially enlightening when he was discussing the exposed-roots mounding con is that exposed roots have a tendency to grow straight down in search of soil. And straight down is NOT a good look for nebari! As a fan of mounding, and someone who is always experimenting with exposed roots, since sunlight stimulates them to fatten, I took heed of this warning. Perhaps this can be added to the many reasons we’re supposed to repot developing trees more often, part of the general root pruning and maintenance Peter recommends if we want corresponding development in the above-ground part of the tree. 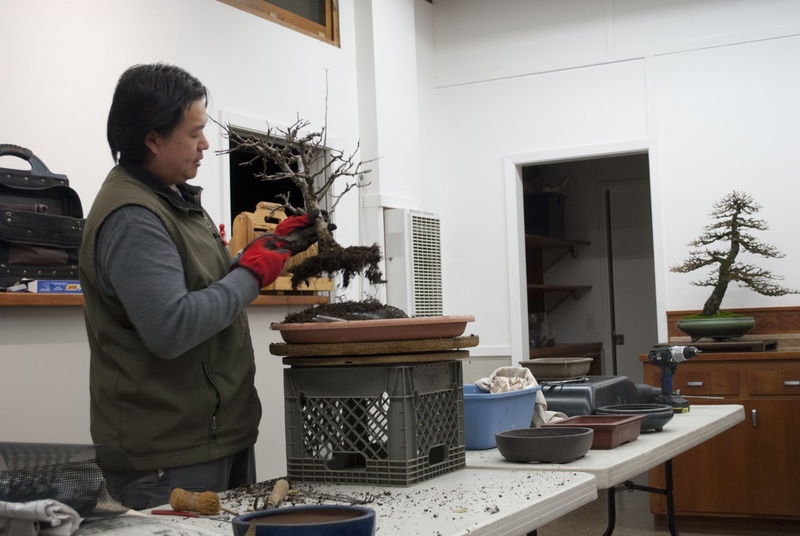 The next Peter tidbit that grabbed me was in his discussion about why it might not be so bad to repot a deciduous tree a little late in the repotting season. Not to where multiple sets of new leaves are open, but if the first leaves are just popping or slightly before that, even better. Such late repotting is a good way to slow the growth of a tree for which rapid development is of little or no concern. Some of the other benefits he mentioned, however, also sound like things we want from our developing trees, in particular the shorter internodes that apparently result from the slowed growth. The smaller leaves that result would be more for developed trees, but I like them on my developing trees, too, if at all possible. Or maybe I’m just looking for excuses to put off repotting some of my trees . . .
Dennis supervises as Peter works on his tree. For me, the biggest revelation in Peter’s demonstration came when he was showing how the tie-in wires work. Most of us have seen the four-point tie down procedure (complete with the “pig tail” for a full wrap-around) many times, but Peter had at least two specific details of that procedure that I’m sure I wasn’t the only one hearing about for the first time. To begin, he made sure the wires went into the rectangular pot such that every other wire was longer than the other. They would all be the same length in a square or circular pot. The reason for this is so that one wire reaches all the way over to the root of other. Um–what?! Am I the only one who missed this in other demos? The only two wires that meet in the middle are the last wire and the little pig tail you attach to the root of the first wire. And those should meet where your tree roots are strongest. When I say “root” in relation to the tie-down wires, I’m talking about the point at which the wire emerges from the soil and the tree’s root ball. The second remarkable point about tie-down wires that Peter made involved the tightening of the wires. Apparently, when the first-through-third wire ties are made, there is NO TIGHTENING. Again–what?! I’ve been half-tightening all the way around as I go! Thank you for setting me straight, Peter. When the first wire meets the second at the root, you simply twist them once, snugly together against the soil and tree roots, and move on. Same with the next two points. At the end, when the fourth wire end is meeting the end of the pig tail you attached to the root of the first wire, you allow them to meet in the middle, and this is where you do all the tightening. Be sure to pull on the wires firmly before and just a little during your twist so that the twist does not overlap itself. Bunched, overlapping twists are the primary cause of broken tie-down wires. In other words, you tighten the wires around the root ball by pulling on them before twisting, not by using the wire twist like a tourniquet. This also helps avoid getting roots caught in the twist. And by tightening everything together at the end, you eliminate the frustrating tendency for the tree to get crooked in the pot if you were to tighten individual pairs of wires. Thank you so very much to everybody who stayed extra late after Peter’s demo to help clean up. I don’t see the handout link , please send it to me if you can. 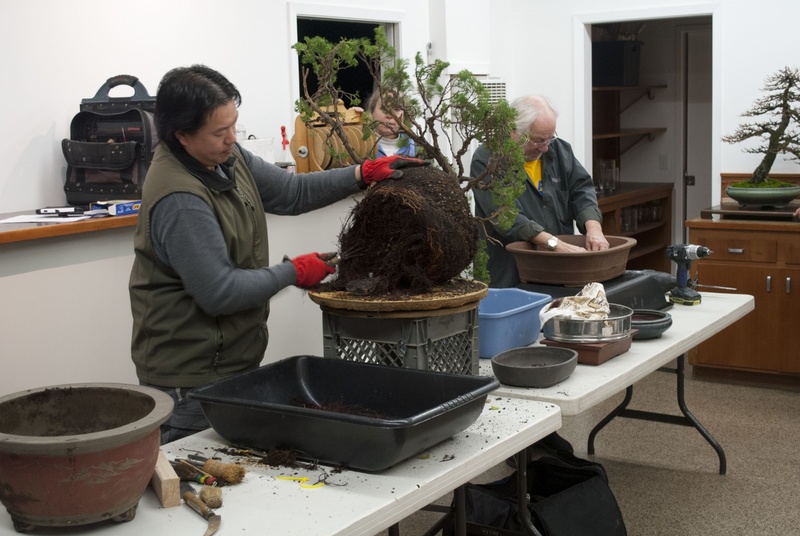 If there was a handout, it would belong to the presenter – not Marin Bonsai Club. We wouldn’t publish it on our website or send it to anyone who isn’t a member of our club. Thx Sharon. Appreciate the reply. I asked because I saw this comment on the blog ………. Ohhhh. It doesn’t say that anymore! (I deleted it just now.) Thanks!